Amazingly, in just two years, Kéré raised $50,000. 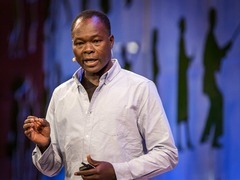 To hear how he rallied his village to help with the construction of the school — and how he got them to accept his very out-of-the-box idea to construct it out of compressed clay — watch this incredible talk. Want to help Diébédo Francis Kéré’s work? Support Schulbausteine für Gando (Bricks for Gando). Visit the organization’s website and check out their Facebook page. Reblogged this on The Conscious Aim.